Last night I used a modification of my firedome project. I swapped the kettle's lower hemisphere for one that had an 8" hole cut out of the bottom. The idea was to increase air flow, hence combustion, and get the temps inside the dome to about 1,000°F. That gaping hole, compared to the normal venting, apparently screwed things up. 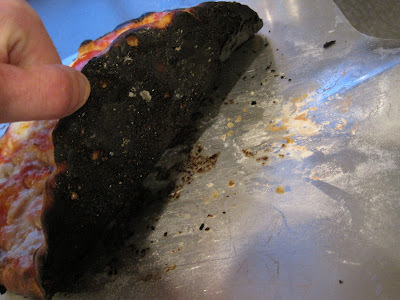 I did get a dome temp of about 950 for an hour or so, but when I tossed on a pizza, the bottom charred in about 2 minutes while the top was undercooked. Oh, and Dave the Brilliant changed another variable while he was at it. I used lump charcoal. 2 Variables changed and char formation. What to do? The Pizza Grand Prix is nearing (March 14th at WildGooseCreative(.com, come by and I'll autograph your kettle) and I'm busy as hell with the 9-to-5. I'm backing off to the normal lower hemisphere, using lump and will probably have time for one more test run. I'm not terribly worried. I think the massive cutout in the kettle, in hindsight, was just too radical a change. Pizza in the grill is all about uniformity: getting the top and bottom to cook at similar rates and who knows what that hole in bottom is doing compared to the relatively closed and vented system of the normal kettle. The lump will be a fun and relatively conservative tweak that I believe will be constructive. Dinner that night was interesting. Half the night's intended menu had undergone near complete combustion leaving only residual ash and char. I took the other blob of dough and heated the regular oven fast, using convection, and tossed on a legume side and some fresh raw veggies. We had a meal in about 20 minutes and I had lots to think about. After the initial shock of disappointment, failures can be pretty instructive. Wish I hadn't waited so long to give it a test drive.